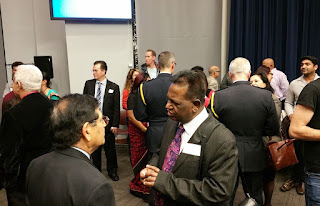 South Asian Leaders Meet & Greet with Toronto Police ~ The Toronto Hare Krishna Temple! On Friday, December 4, 2015, members of the ISKCON Toronto Temple Council were invited to attend an official "Meet-and-Greet" with the Toronto Police. Aimed at bringing together members of the Toronto Police with leaders from the South and West Asian communities, the event was held at the beautiful headquarters of the Toronto Police, located at 40 College Street, right in the heart of downtown Toronto. The event saw close to 100 attendees from all different communities and organizations. The highlight was the attendance of Police Chief Mark Saunders. He addressed the crowd with a nice speech about how the Toronto Police deeply value the contributions of community leaders. There were also speeches and presentations from other groups and community leaders. The host then invited any attendees to come forward and introduce themselves and their organization. We had a chance to introduce our temple, what we do and the ways that we serve the community at large! With that, the event continued with mingling over food and refreshments. Very nice connections were made and we are looking forward to attending future events with the Toronto Police! awesome ! Nice pics too !